EA Johnson is in town, meeting with Labora’s makers. You can see what else he has been up to at flatfish.ee. Enjoy his interview with Marian Habicht about how she brings medieval binding techniques to life. A blank page. An empty notebook. Sometimes nothing can ever seem more challenging when you sit down to write …. OK. So, these days I might have started with: A blank screen. An empty notebook computer. Sometimes nothing can ever seem more challenging when you sit down to write …. Although when you get right down to it, not too much about the writing process has changed except for a few words here and there. And since Labora is all about reintroducing Medieval crafts to the modern world, we really need to go Old School on this one. Trust me. So, …. And yet, there are some tried and true ways to help you make the writing process easier – to help you prime your pump and then help you channel your words. First, you need to find the right pen to write with – you need to find one that feels as if it belongs in your hand, as if it were made for you. And then, if you use that pen often enough, you will build up a nice supporting callous on your finger – one that reminds you that yes, you do write. Next, you need to find the right notebook – you need to find one that feels right in your hands – one which feels like a soft sculpture and which can help take you half-way there. Marian’s beautiful creations are exactly those notebooks. 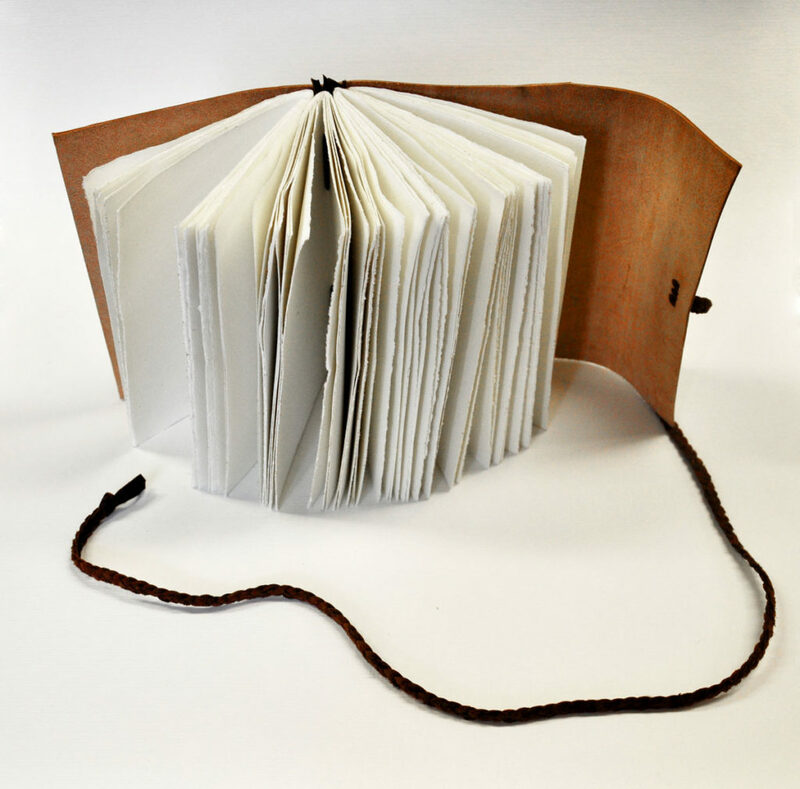 Their blank pages – made of handmade paper – call out for your words, doodles, and drawings. Each empty book – bound with smooth leather in a style known as limp binding – demands to be filled with your thoughts, quotes, signs, symbols, and just about anything else that might be appropriate for your new compilation of personal knowledge. New, of course, is a relative term because one of the most enticing and entrancing features about Marian’s books is their smell – they smell of ancient times and of old truths just waiting to be rediscovered. In other words, Marian has already done half the work of writing for you. Now it’s just up to you – using your pen as a kind of divining rod – to find those words which have always been waiting for you within. So, go ahead and put yourself in Marian’s good hands. 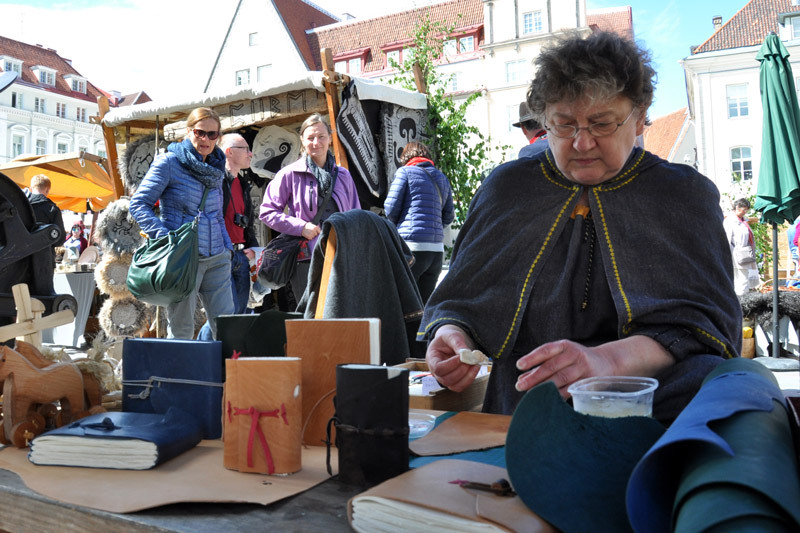 One quick look at the beautiful leather stitching which holds one of her notebooks together is enough to show you that no one knows more about the history of papermaking and bookmaking in Tallinn – experience gained from decades of archival work. Indeed, when Labora was first setting up shop, Marian served as the primary consultant on everything from the making of proper paper moulds with the required number of laid lines to using the right fibres for making authentic sheets of handmade Tallinn paper. And Marian remains the ultimate arbiter when it comes to anything related to either the binding or the making of books. I look forward to reading her history of papermaking in Tallinn as soon as she finds time to finish her manuscript. Until then, just go ahead and hold one of Marian’s notebooks in your hands. You will feel the years of careful thought that went into bringing it forth to the world. And before you know it, you will find that you’ve already come up with the words and images to cover that first blank page. From there, it will just get easier. You’ll find that you’re ready to fill the entire book with your creations and can already image how they’ll become something much more substantial than water. How did you meet Anatoli Ljutjuk and his colleagues at Labora? And how did you come to help him with his efforts to return the craft of handmade paper to Tallinn? Back around 2001, Anatoli wanted to learn how to make handmade paper. A book restorer I knew gave him my number and so he called me. 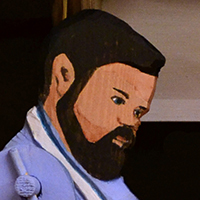 As Anatoli didn’t know anything about making paper back then, I explained the process to him. I told him what equipment was needed. And then when we met, I showed him examples of handmade paper at the Tallinn City Archives where I worked for fourteen and a half years. Later, Anatoli and his son Nestor invited me to work at their Labora shop on Vene Street. I had already started making my notebooks back then which you can still find for sale at Labora’s shop. All along, I knew I had started working in the right company with the right people. How did you learn to make such lovely book bindings? Do you have any favorite binding style or binding type? Originals are my teachers. Working at the archives, I got the chance to handle original Medieval books. The oldest one in the collection dates back to 1257. I was amazed by how simple their limp binding technique was. I was impressed by how strong the books are. And how simple. I wanted to show this simplicity and capture the beauty of this simplicity. Medieval times were not dark times at all. [Showing me examples] Just look at how bright these bindings are! And look how the quires are stitched so beautifully right into the leather binding! To be clear, I don’t make copies – I reconstruct old binding techniques to show how simple and easy books were to make. 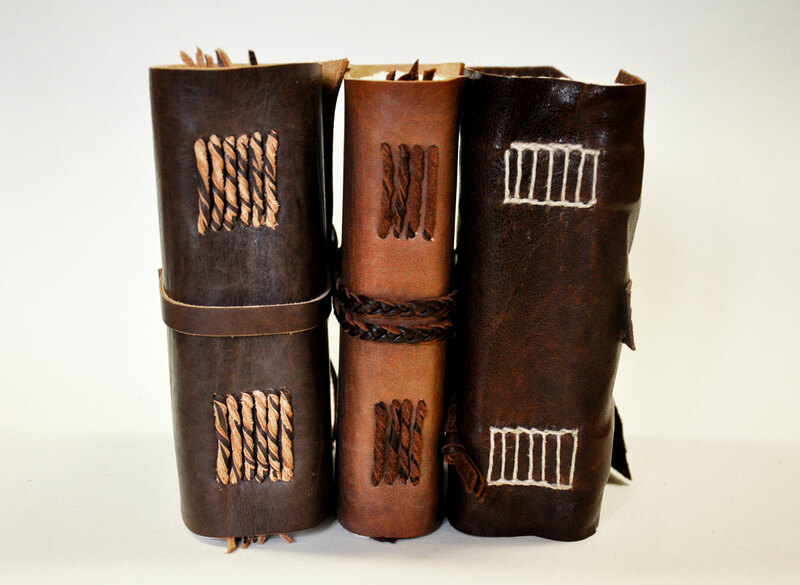 Many Medieval books were bound in parchment – although I use leather as parchment is too expensive these days. I make my own leather oil out of beeswax and other oils to make the leather covers waterproof. The oil also brings out the pattern and the grain of the leather. These details give each book cover its own unique look. Otherwise, old book covers lacked any decoration. It makes me angry when leather workers today want to add their own art work to a Medieval-style book cover. Yes, later on books became more complex. But ornament ruins their original simplicity. I want to show how beautiful a simple binding can be. I like doing this work. It inspires me. In turn, my books are inspired by Medieval account books. They were used by Tallinn’s merchants to take notes, to describe merchandise, to track purchases and exchanges, and to keep accounts. Once or twice a year, a financial reckoning would come so everything needed to be carefully written down. When you make your books, do you embed any special meaning into the feel or the colour of the leather – the kind of clasp used for fastening it shut – the type of stitching in its finding – or even the size of the notebook? The reason I ask is that when I was searching for the right notebook, I chose one covered with a darker leather which I thought was more appropriate to serious thoughts. And then I looked for a clasp which was strong and yet easy to open – plus I love the fact that the clasp I chose looks like a wooden button and reminds me of a pig’s snout. And then, of course, my notebook’s leather cover with its curved flap felt just right in my hands. In short, how do you decide what kind of books to make? My ideas for new books come from the leather itself. First, I find a good piece of leather. Then I look at its edges and start seeing what might be possible. I ask myself: what might come from this leather? The leather is not always perfect – but so what? For example, I once used a piece of leather with a hole in it. The hole became a part of the binding. When another bookbinder was looking at the book, she asked me about the hole. I explained that Tallinn’s Medieval merchants were very practical thinkers. They used what they had. They used the same material several times – new books were often bound from the remains of old books. Leather, paper, everything was too valuable to waste or to be thrown away. Even leather with a hole in it …. She bought the book. I use a lot of brown – the natural colour of leather – as it was the most widely used colour of its day. But red was also popular – they would dye the leather red. They used some green as well. You would never really see any blue – although I have made a couple books from leather dyed blue. The one colour you would never ever see – which just didn’t exist – was black. Even the inks that were used back then were mostly different shades of brown. In terms of clasps, I use different ones. Some people like it when old coins are used as clasps and so I will search for them in Tallinn’s antique shops. In terms of stitching, the other wonderful thing about limp bindings is that you can add quires – or even take them out – just as it was done in Medieval times. The soft leather fold gives each book the chance – the room – to grow. My hope is to show people today the simplicity and beauty of these early book bindings. I want my books to live with you, to become a part of you. 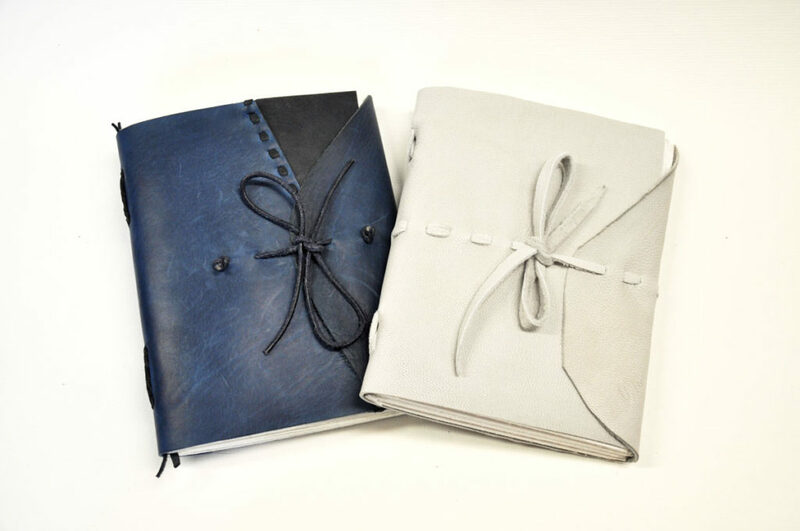 I want each leather binding to take on your personality, to alter its shape as you handle it. [She bends one of her books to show me how]. I want the leather to absorb the sweat and oil from your hand, I want you to watch how the leather changes its colour. Each of my books is different from every other. No two are ever the same as I don’t repeat my work. I want each of my books to be as unique as you are. This is the framework within which I want to do my work. 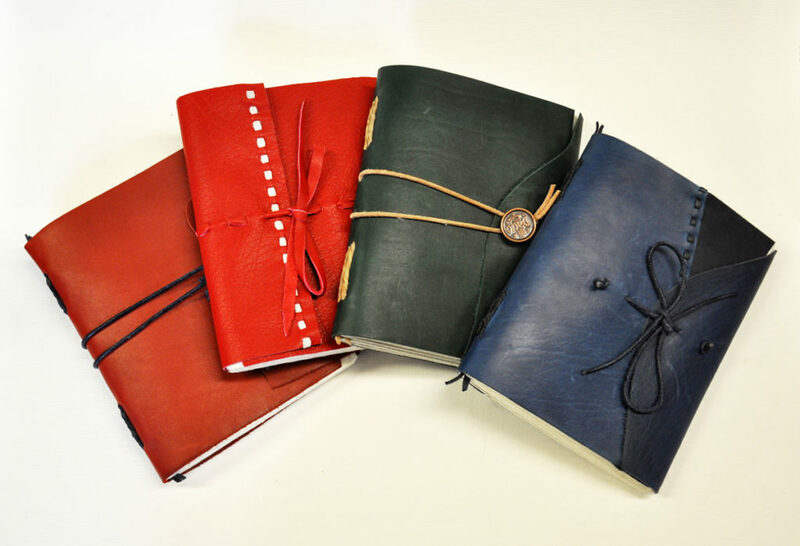 Marian’s wonderful handmade notebooks are available at Labora shop at Vene 18, Tallinn.